Harold is angry with Lou after finding out where his money went, and even angrier that Lou ran away from his family and friends. Lou is looking very ashamed. Connor is telling Michelle that Valda put the hard word on him, saying that Michelle would be better off continuing her studies in New York. “Michelle, I am not a bad person, alright. I work hard… I recycle.” Shell tells him not to worry, she was the one that decided to stay, and he didn't make her do anything. Connor's still not entirely convinced. Harold is trying to tell Lou that he'll have to sell up his businesses, but Lou says that they're his identity and he can't. “Well you really are bankrupt then, aren't you,” says Harold, grimly. Karl is talking to Margaret, one of the people from the admin department. She wastes no time in asking him out, “Would you be interested in spending a pleasant evening with me?” Karl stutters and stammers his way out of it saying that he's still getting used to his own company, and the separation is still quite new. Margaret is persistent though and writes her number down for Karl anyway. Connor is asking Max for advice and wonders if Max would think that he'd be a potential suitor for his daughter. “Oh, I think Summer's still a bit too young, mate,” Max replies with a smirk. Connor tells him that all of the Scully's have a problem with him at the moment, bar Lyn, and that they can't see that he wants what's best for Michelle too. Max says that Connor has to prove that to the Scully's. 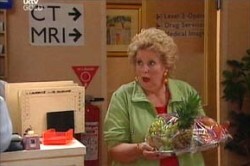 Valda has popped by to see Lou, bringing a big fruit platter. When she goes in to see him though, he tells her to leave him alone. “Go away, stop haunting me. Leave me in peace woman.” He's been having the hallucinations about Valda again and thinks his mind is playing tricks on him. Karl is telling Harold that he has to go back to Susan's to pick up some stuff tomorrow when Valda storms angrily out with her fruit platter, shoving it at Harold. “Here, give this to someone that needs the fibre!” Harold casually passes it on to Karl. He then tries to tell Dr. K that it would be a good idea to call Susan before he just goes around there. Karl doesn't get the message though, so Harold spells it out for him. “You are not the only one that's getting a bit of action.” Karl looks a bit taken aback. Connor is still worrying about him and Michelle, so he comes up with the sudden idea for the both of them to move to New York. There's a faint glimmer of possibility that washes over Michelle, but then she points out that Connor would lose his Australian residency. Connor just wishes that he could do something heroic for her sometime. Michelle laughs and says “well how about you give me your credit card and cancel your plans for the evening. If the whole world doesn't want us being together, we'll just have to create a little world of our own.” Connor looks intrigued. Karl is coming out of his old house when he sees Max. He jogs over to him and apologises for his behaviour the other night at Max and Steph's engagement party. “I don't know what got into me, I'm sorry. I didn't mean to cause such a bad scene.” Max doesn't stay mad for too long, and smiles. “Ah, it's not the first time my sister and bad scenes have been in the same room together and it won't be the last.” Karl says it wasn't Izzy's fault. They have a little catch up and Max can see that Karl is a bit lost even though he says he's doing fine. “Look Karl, if I've learnt one thing over the last few years it's that happiness comes along when you least expect it. What you got to do is grab a hold of it. Hope for the best.” Karl takes this on board. Karl catches Margaret going by in the corridor. “Margaret, I was thinking about your proposition… ah, your proposal… what you suggested! Sorry, I'm not very good at this!” Margaret says that's fine and is keen to go out. She suggests they start with a drink and see where that leads them. She leaves just as Connor and Max come in to see Lou. Karl directs them to his room. The guys walk in, a little shocked at Lou's haggard appearance. Lou looks ashamed and says to Max that he doesn't expect him to forgive him, and that he probably wants him out of the partnership. Lou starts to get upset and Max gently tells him that they're there because he's a good mate, none of that other stuff matters. The air is cleared now, and Max, Connor and Karl are joking around with Lou about how they would have bought shares in the Periwinkle Powder if it had have been a success. Karl says that Lou needs some sleep and Max and Connor leave. Karl and Margaret are on their date. They're talking about separations and divorces (by the sounds of it, Margaret's been through a few). She brings that conversation to halt though, and says that she wants to know more about Karl. Connor is lounging around on the bed with his white robe on while Michelle explores the room. Connor keeps asking Michelle silly questions about how much she loves him, like writing into the Erinsborough news about their hotel love shack, leaving no details out of it. Michelle grins and says she'll just show him and gives him a kiss. Michelle has just finished painting Connor's toenails a nice bright red when she asks him if she can give him a full makeover. Connor is well against the idea until Michelle playfully guilt trips him into it by saying that he'd let her if he loved her. He agrees, and then ruefully agrees to wear it in the hotel lobby in the morning as a dare. Michelle happily starts to put some eye shadow on him. Connor reacts like she's poking his eyes out with a pin. Margaret is pretty irritated with Karl (he had been hiding out in the bathroom for ten minutes!). She says he's pathetic, just like all her ex-husbands. Karl asks Max for the bill and Margaret scoffs at him, “It's not the 1950's you know, I can pay my own way.” She pays Max and leaves, spouting this piece of advice at Karl before she goes. “Stay out of the dating scene until you're up to speed with what women want. And it's not to flatter your chauvinistic vanity.” Max smirks at Karl, and Karl just looks bewildered. Michelle is taking great delight in parading a heavily made-up Connor in the lobby. They're about to walk through when they see Lori standing at the reception desk. A baby is crying in the pram next to her, and it looks like for a moment that it's not hers, but then she leans down to pick the baby up. Connor and Michelle look stunned, and Connor realises what's going on. Lori sees them, looks a little startled, then comes over to them. “Hi Connor… this is your daughter, Maddy.” Connor looks like he wants the earth to open up and swallow him whole. Maddy just smiles away like the cutest baby on earth that she is.